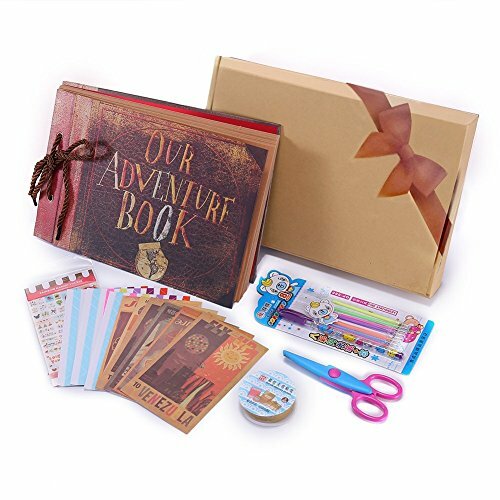 ★The cover material of the photo album is high-quality hardcover, engraved with cool "OUR ADVENTURE BOOK". After opening, the solid box cover and the excellent paper of the memory book is even more surprising. Well-cut pages fit for what you want to showcase or write down.Postcards , photo corner stickers, cute tags, scissors all you needed is included. ★The light brown pages offer enough memo space to write in. You can write down a description freely. You can organize many photos, scrap-booking dies, ornaments, flowers, letters, quotes on them. Make your own personalized gift filled with photos and notes for your family and friends for a special occasion - maybe for a wedding, anniversary, birthday, thank you, birth, baptism, communion, enrollment, leave, graduation, engagement, retirement. View More In Albums & Refills. DIY Scrapbook Photo Album 80 Pages Burlap Cover Album Craft Paper Album, 10 x 10 Inches, with Photo Album Storage Box Perfect Gift for Anniversary, Valentines ect!